My husband is the Appointed Family Griller. He grills year-round, on-location, and sometimes at 11 o’clock at night. So for Christmas this year, I called upon my trusty Girl Scout training and helped the kids make some firestarters (we have a charcoal grill, along with the propane one you see above. 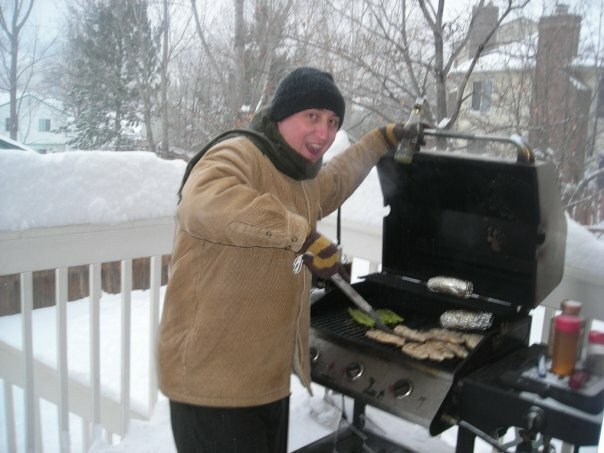 I told you he was serious about his grillin’…). The total cost: $3.50 for hamster shavings since we don’t actually own a hamster. Everything else we had around the house. 1.) Melt the candles in an old pot on the stove until they’re completely liquified. 4.) Pour the melted candle wax in each carton until shavings are saturated. 5.) Let harden. Cut each cup from the carton. I also saw a great idea (on Pinterest, of course) in which someone put matches in a mason jar, attached a circle of sandpaper to the lid and had a jar of waterproof matches. So I tried it. Annnnd — it didn’t work. I tried three different kinds of sandpaper, but couldn’t get the matches to light. I finally glued the lighting-strip-thingy from the side of the matchbox (what is that called?) to the lid instead. And there you have it. A firestarting kit for grilling, campfires and the like. Just a note: I asked my husband not to read this post…so if you should see him before Christmas, please don’t tell him his present. Unless you want to…you know — RUIN Christmas for four small children. thanks for linking up at a Homemade Christmas linky party!